Telecom acronyms in cellular systems. 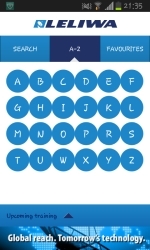 Best such App on the market. Check it now! 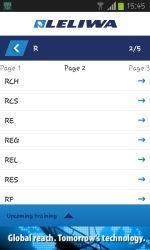 “Telecom Acronyms Finder” is a simple and free application, manufactured by Leliwa that allows you to find the elaborations of technical abbreviations used in cellular systems technologies GSM, GPRS, UMTS, HSPA, LTE, IMS, etc. In scientific publications, brochures and specifications, abbreviated names of mobile network elements, technologies and standardization groups often appear. Authors generally refer to the commonly accepted abbreviated names, without elaborating their meaning. The application allows you to quickly find the elaborations. In many cases, there is a reference to the description in Wikipedia. The database contains over 2000 acronyms. The application allows for searches in two modes: via name of abbreviation or a fragment thereof, or alphabetically. In addition, you can group shortcuts found in favourites, which results in easier access to the most commonly used. The application was developed for participants in training courses organized by Leliwa, for whom it will facilitate movement through the training topics and speed up work with the training materials. It will definitely be useful both to those who on a one-off basis want to find interesting technical abbreviations and experienced engineers who for many years have been dealing with mobile technologies such as GSM, GPRS, UMTS, IMS, LTE, etc. The application is free of charge. The creation of the application was commissioned by Leliwa. The company has been providing the highest quality training services for over 16 years. Leliwa has cooperated with many telecom equipment vendors such as Ericsson, Nokia, Alcatel, Siemens, NSN, Samsung and cellular operators such as Vodafone, T-Mobile, Orange.